if i use this a 2nd time i get an error. Putting out an update right now that fixes that, hang tight. I waited to include more stuff in this update, but I should probably have released a patch earlier that just fixes this problem alone. Sorry. One suggestion, though. It may sound odd but… would be superuseful and unique. Hi @IPv6, thank you for the support. I’ll add this to a feature requests list, if there’s enough interest we can think of implementing something like that. I got some notices in the other window when using the addon, thought maybe you coudl look at it. Doesn’t stop function but it looks like there is some need for annotation work (I have found my own add-on needs similar work). @Craig_Jones Thank you for the notice. This is from when it was a single script that “worked” on both 2.79 and 2.80, at the cost of getting a version warning on 2.79, and this annotated property warning on 2.80. That’s why I split it into two versions, one for each Blender, so each version can best serve the specs. I sent a Gumroad product-update email, you should be getting it about now. Thanks for reporting guys. It’s been fixed. Added customizable keymaps in the add-on preferences. Improved behavior of the “Use Extremes” option. If you already have it you will be getting a Gumroad email with the updated scripts for 2.79 and 2.80. Thank you, I really enjoy the flexibility this add on gives. I am starting to like this tool. This tool is what everyone needed for years. I was getting tired of proportional editing for sure. b) Ability to temporarily lock mesh deformation (eg. with Enter), so that I can move curve points to eg. center for finger, of center of leg, and then unlock deformation pressing enter again. c) Ability to scale points - eg. using curve point Radius property ( default hotkey alt+S). Combining b) and c) user could inflate limbs, taper shapes etc. Those are some cool images guys, looking great! Hi Bartosz, good to hear from you and thanks for the feedback, I’m going through it. The line problem affects the results of the tool, so I’ll take a look at it first. I think it can be addressed with geodesic distance, rather than the mesh.select_shortest_path(use_face_step=True) operator that’s being used right now. Great addon, thanks a lot for doing this. Thanks a lot @1D_Inc. Your tools look amazing. Hi @khao, you didn’t do anything wrong. The latest 2.80 build changed some things in the Blender API, I’ll release a patch to accommodate that. Thanks for reporting! Great work, RNavega. I find it very useful! There’s a little problem when trying to assign a shortcut for the tool. 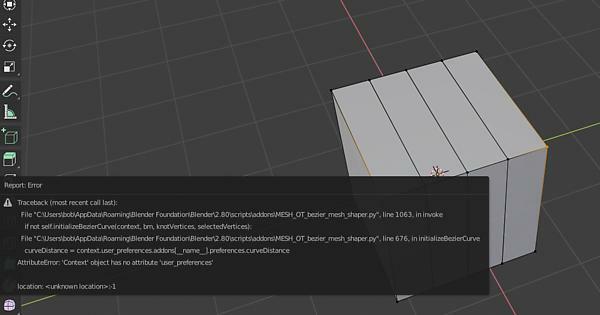 It worked for the first time but when you close Blender and open it again the shortcut is not saved (I rememeber I saved the satrtup file with the new shortcut for Bezier). Also after you open it the second time it crashes Blender 2.80 Somehow I managed to use the tool again by saving a new file and activate the tool again on a mesh. Hi @artoonick, I’m not being able to reproduce it on my end. I tested it with the latest 2.8 for Windows 8.1 (https://builder.blender.org/download/), the hash is 91a155833e597; you can check the hash in your 2.8 by going to the top menu -> Help -> Splash Screen, it’s on the top right corner below the date. 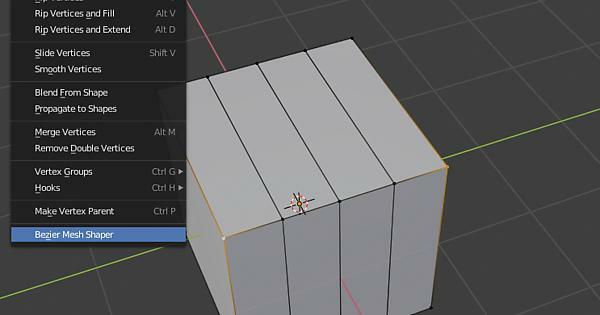 When I changed the shortcuts and pressed Save Preferences, closing Blender and opening it again it works fine (with the new changed shortcuts). Each time you tick and untick the add-on checkbox the keymaps are registered / unregistered, so please see if that helps in case there’s some obscure problem we haven’t discovered yet. I’ve noticed that it crashes once after you save the new file. . If you open it again it works. I managed to save the shortcut assigned with export keyconfig and saved the prefs. Great addon! 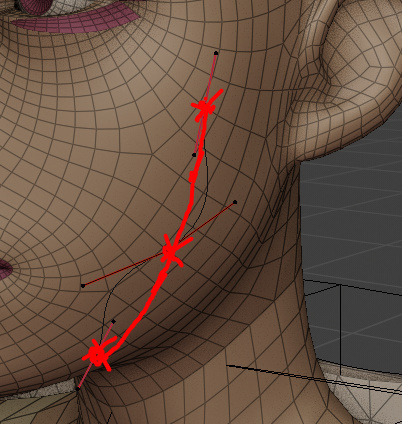 Though I would really prefer to have the option of using NURBS curves, since they are quicker and easier to manage. The bezier handles are fiddly for quick adjustments. So question, I tired using this with my shape keys but it doesn’t do it at all. Not sure if that’s just me or not but, is this able to be used with shape keys at all or no? Thanks for the feature request. I think this would be better as another separate tool, for technical reasons (for me it’s easier to make one tool that does one job well). Thanks for reporting. 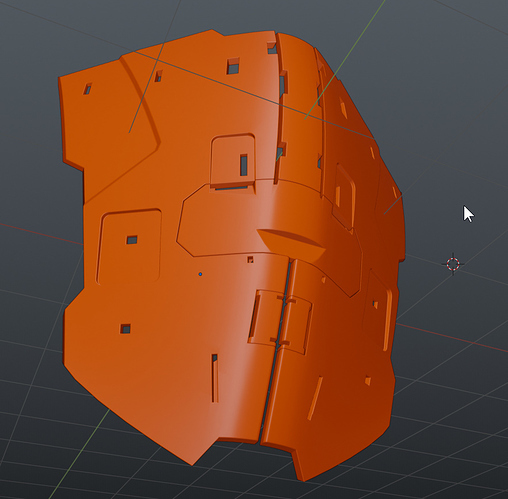 I don’t remember testing it with shape keys, it might need to react differently with them. I’ll take a look into it. New update coming soon by the way.